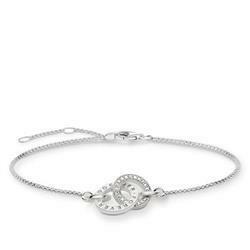 This beautiful bracelet by Thomas Sabo features a dainty 925 Sterling Silver Chain adorned with interlocking rings, symbolising an unbreakable bond. One ring is inscribed with "TOGETHER FOREVER" and the other sparkles with Cubic Zirconia pave. Wear for timeless elegance and dazzling shimmer.